When the University of Central Florida was first in the spotlight of a state auditor’s report exposing tens of millions in improper funding surrounding Colbourn Hall, a promise was made to one employee: take the blame for the incident and it will all go away. Knight News sat down with the employee, former Chief Financial Officer and Vice President William Merck – and his lawyer Charles Greene – in early January. They brought to light closed-door interactions between officials, including another promise to Merck: show up to a state meeting on Colbourn Hall and be fired. The former CFO saw an opportunity to speak at a Board of Governor’s meeting on September 13 and defend UCF’s decision to raze Colbourn Hall while moving its students and faculty to a new building, according to both the interview with Merck and in a letter from Greene to the Board of Governors. Colbourn Hall, they allege, posed significant health and safety concerns to all individuals who passed through the building after four engineering reports were completed and given to administrators. But before the meeting, according to Merck, the second promise came when he asked to attend the Sarasota meeting along with UCF President Dale Whittaker and Board of Trustees Chairman Marcos Marchena. 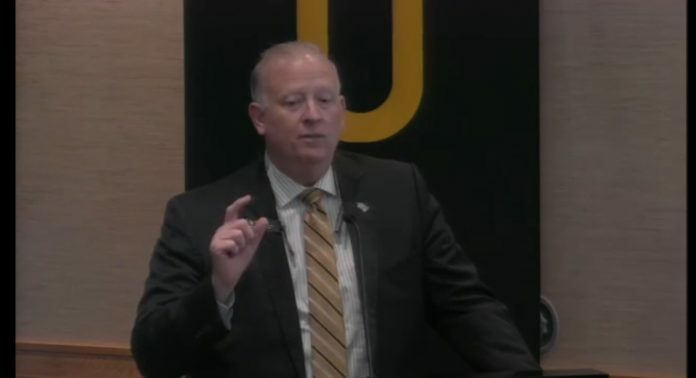 Merck would be informed by the UCF General Counsel Scott Cole that President Whittaker did not want him at the meeting, and if Merck were to show up in front of the Board of Governors, it would be viewed as an act of insubordination and a cause to be terminated. Greene referenced the interaction in a letter to the Board of Governors while criticizing the scope and method of the private investigation led by Joey Burby which was hired by, and at the direction of, the Board of Trustees. “The Burby Report goes out of its way to criticize Bill Merck because he did not consent to an ‘interview’ by Burby […],” Greene said in the four-page letter. At the BOG meeting, Whittaker and Marchena pointed to Merck as if the sole person responsible for the Colbourn Hall decision and failed to defend UCF in front of the state university system, according to Merck and Greene. Whittaker, they argue, sought to absolve himself of fault by blaming Merck and repeatedly reiterating to media and lawmakers Merck’s decision to resign, despite the promise in private that his reputation would be protected if he resigned. It’s unclear whether the ultimatum presented by UCF’s general counsel could violate the vice president’s first amendment rights, if true. This area of law is complicated and often decided case-by-case. Ultimately, Merck did not show up to the meeting. Knight News received no reply after emailing Cole Tuesday night for comment on the allegations. Burby has ignored Knight News’ requests for public records created during the investigation of UCF. The Board of Governors is set to address UCF’s Colbourn Hall controversy Thursday in a meeting at FIU. Florida House leaders appeared unpleased by the scope of the investigation and its conclusions.